Beer is great on its own, but with the right food, it can be even more delicious. Looking to pair your favorite beers with a bite to eat? Try these 11 matches made in beer heaven. The big, sharp fruity flavors of the best India pale ales cry out for a companion that can match them punch for punch. Look no further than a block of a nice sharp cheddar. Brewers and cheese makers alike agree that cheddar makes the perfect complement to a glass of IPA. The crisp, clean flavor of lighter German-style lagers can be a great match for your favorite shellfish. These beers will elevate the experience without overwhelming some of the more subtle flavors in the fish. 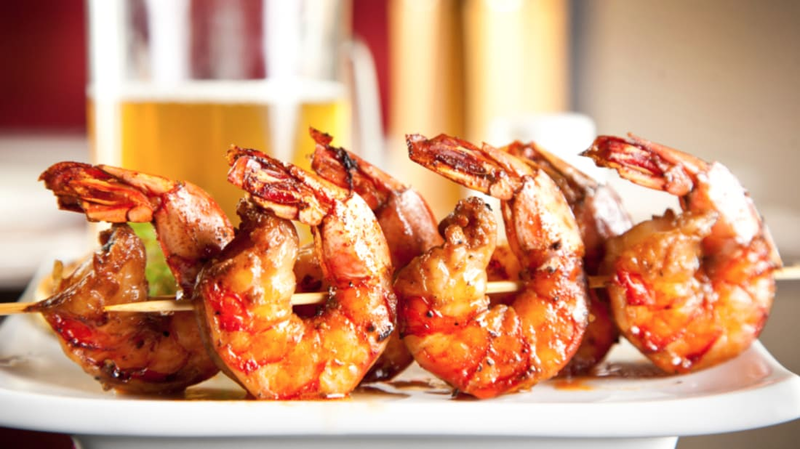 Some more complex American examples of lager can also be paired with more flavorful seafood dishes like paella. Stout may seem like a curious match for the already rich, robust flavors of Texas’s official state dish, but the experts at craftbeer.com recommend washing down a bowl of chili with an American stout. Stout has the heft to stand up to the chili’s big flavors without backing down or taking a backseat to the peppery delicacy. If you’re planning on celebrating National Lager Day with a classic beer-drinking dish, consider matching that Bratwurst with a helles lager. The pale Bavarian staple lager is a classic companion for bratwurst, and when it comes to pairing beer and sausage, if it’s good enough for Germans, it’s good enough for us. Barleywines make incredible companions for cold winter evenings. Their potent alcohol content gives them the ability to age for years in a cool cellar, and once a barleywine has reached the peak of its complexity, it is a viscous, complex treat with lots of caramel and toffee notes. Serious Eats recommends you take this decadence to the next level by pairing a good barleywine with a salted caramel. These malty, powerful lagers are another go-to pour for cold nights. To bring out the most in a doppelbock, pair it with a similarly strong flavor like roast pork. If you want to get really ambitious, you can even use your favorite doppelbock to braise your meat. If meat isn’t your thing, you can still find a perfect match for your doppelbock. Cheese magazine Culture recommends pairing them with Swiss, Camembert, or even Limburger. They may not get as much buzz as stouts or IPAs among beer fans, but a well-crafted brown ale can be a great experience. Serious Eats touts the ability of brown ales to pull out and heighten the nutty characteristics of acorn squash and other cold-weather produce staples. Don’t stop there, though—Craftbeer.com hails brown ales as “some of the most food-friendly styles of beer” and reports successful pairings with everything from sushi to Mexican to barbecue. Rauchbier boasts smoky, meaty flavors that are easy to compare to liquid bacon or barbecue, so they’re a natural match for actual barbecue, too. The experts at the Brooklyn Brew Shop agree, pointing out that the beechwood-smoked malts used in these German lagers will bring out the best in smoky barbecue ribs. Chocolates aren’t the most discriminating friends for beer. Both beer and chocolate are diverse enough that if you do some digging, you’ll find two that get along pretty well. When in doubt about what to pair with a dark chocolate, reach for a porter. The experts at Vermont’s Lake Champlain Chocolates advise introducing their dark chocolates to a porter, while the tasters at The Kitchn sing the praises of smoked porters paired with spicy chili chocolates. Credit for this surprisingly excellent pairing goes to DRAFT magazine. According to DRAFT, the magic is all in how the beer is just sweet enough to match the pineapple-and-ham combo, but the hops are there to counteract the acidity of the pineapple. However it works, it’s delicious. Los Angeles chef and restaurateur Sang Yoon told Food & Wine that when he’s looking for the right pairing for an Asian dish, he reaches across continents to find a match. Yoon feels the wide range of diverse flavors found in Asian cuisine are most likely to complement or contrast with Belgium’s equally dazzling array of styles. Try ordering a malty, sweet Belgian dubbel to sip alongside your next spicy noodle dish and you’ll realize Yoon is on to something here.